Double shaft shredder have been designed for a wide array of applications and industries, suitable for shredding solid material such as E-waste, metal, wood, plastic, scrap tires, packaging barrel. Pallets, etc. And particularly well suited to the size reduction of bulky or voluminous materials which could include contamination such as metals or stones. Depending on input material and the following process the shredded material can be used directly or go into the next step of size reduction. It can efficient to increase the bulk density and decrease the transportation cost. Shredder in Zibo United Tech Machinery Co., Ltd. is widely used in industry waste recycling, medical recycling, electronic recycling, pallet recycling, municipal solid waste recycling, plastic recycling, tire recycling, paper making industry, etc. 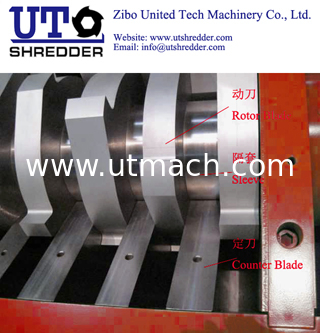 Double Shaft Shredder has two rotors built into the machine that rotate at low speeds, high torque and low noise. With the function of Siemens microcomputer control system, it is possible to control automatically start, stop. Zibo United Tech Machinery use the automatic reverse sensors to protect the machine against over loading and jamming. The knives which Zibo United Tech Machinery Co., Ltd. useing imported high-quality alloy steel, with high strength, good toughness, not easy to break and so on. And can to ensure that there is a good blade in the work, disassembly, and easy to maintenance.